Before I start this post, a bit of counter-intuitive trivia: Today, the 10th December, sunrise in Punta Arenas (where we have long summer days) was at 08:12 UTC. In Plymouth, UK (where the days are shorter), it was at 08:05 UTC. That is, on the Pacific coast of southern Chile, sunrise today was at almost the same time as it was in western England! The bus from Puerto Natales with Bus Sur was nice and easy. It cost 6000CLP when I booked it a couple days ago (£6). It was incredibly busy though – so much so that the 10:00 bus had actually become two buses, and there was an additional 10:15, which I was on. This did mean our bus wasn’t completely full, though. The most surprising aspect of the journey was the scenery. I had expected some mountains and glaciers, but it was completely flat. Initially, there were forests of short trees, their growth apparently stumped by the wind, and cattle ranches, and areas where the former had been cleared and cattle were starting to take over. As we neared Punta Arenas, the landscape became more scrub with sheep grazing on it. Indeed, parts looked a bit like the flatter areas of Dartmoor’s High Moor, but without the granite. 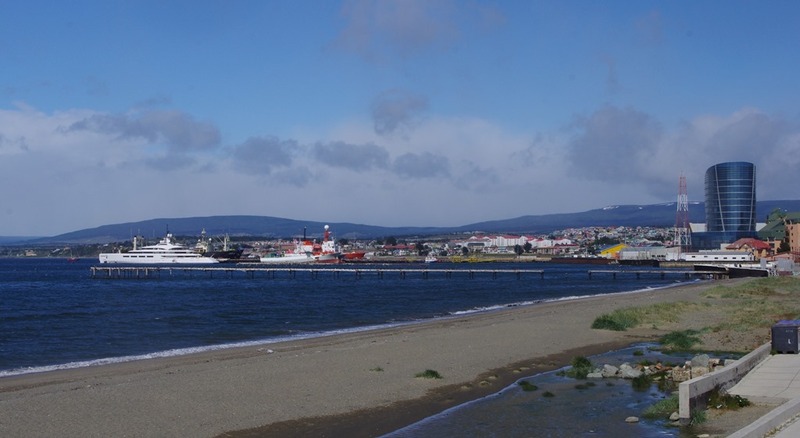 Punta Arenas is the southernmost reasonably large city in Chile (though not the most southern settlements; those are Puerto Navarino and Puerto Williams in the south of Tierra del Fuego). As such, the port is quite busy and is one of the focal points of the areas, with both commercial cargo and cruise liners headed to Antarctic waters. Despite the industrial nature of the place, it’s also able to cater to tourists as it has quite a bit of history. A plaque on the site of the former post office, for example, commemorates the day in 1904 that Captain Robert Falcon Scott popped in to post 400 (yes, four hundred) letters announcing that the Discovery had returned safely from the Antarctic! Another plaque celebrates the hotel in which Amundsen stayed before he headed to the Pole. There are also, understandably, plenty of statues to past explorers and some rather ornate buildings. 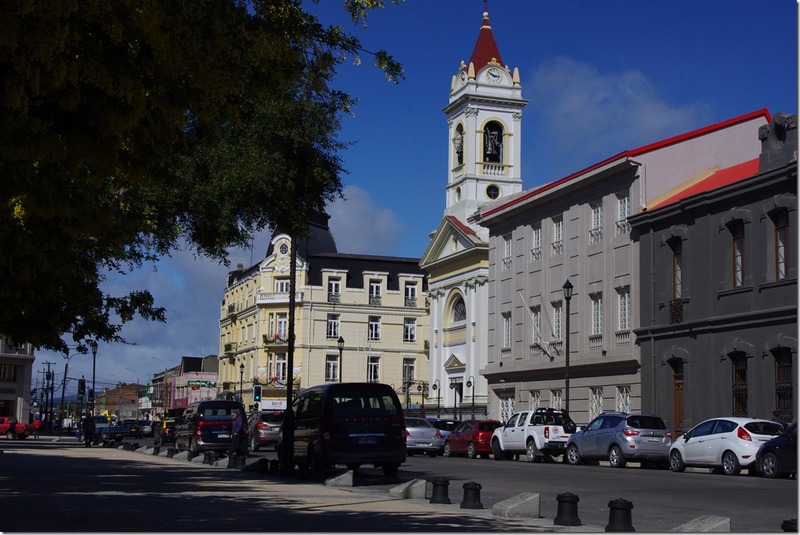 Punta Arenas also has a decent number of good restaurants to cater to the tourist trade. While I was in one of them, having a very nice salmon filet with mashed potatoes, I realised that at this time of year it would be almost impossible to get a restaurant table in the UK because of office Christmas parties. I get the sense that such things don’t exist here; at least all the restaurants I have been into on my trip have had plenty of space. 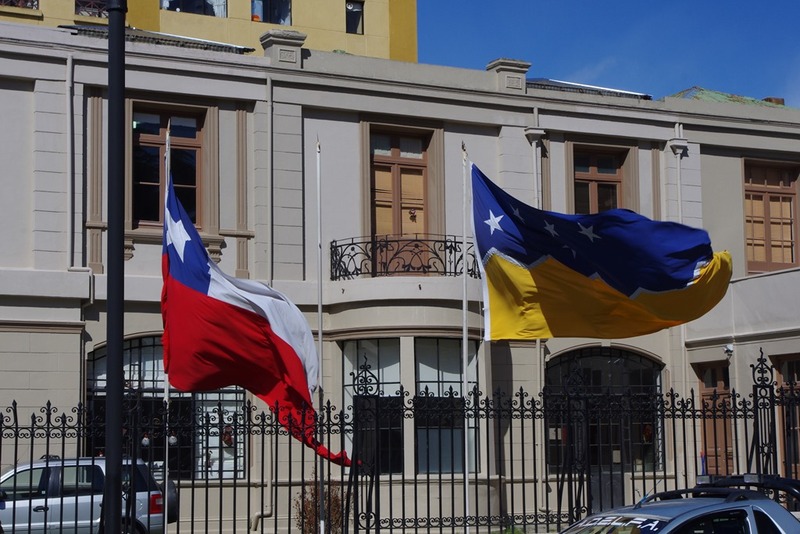 One thing I noticed, both in Puerto Natales and here in Punta Arenas, was a sense of regional identity. 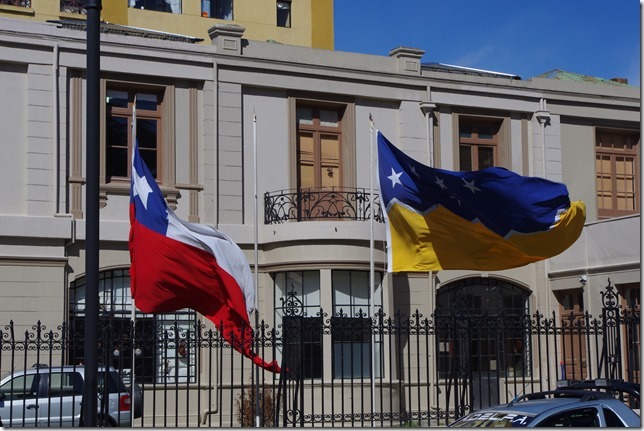 Public buildings fly the flag of Magallanes next to the Chilean national flag. This is something I hadn’t seen even up in the Atacama. The only sense of a separate identity from the national one that I had previously encountered was on Chiloé, which is understandable as it’s an island. I suppose that this region, Magallanes (named, of course, after Magellan), is remote, however, and as such it is slightly insular. If it weren’t for the Carretera Austral, there would be no way to reach here other than by air or sea (other than going via Argentina, which is what most people do). Punta Arenas is renowned for being windy. I read somewhere that in the spring, when the winds are typically worst, the local authorities run ropes between the lampposts to enable people to pull themselves along the pavements, and I think I found one example of a piece of rope serving this purpose that hadn’t been removed prior to my trip. It wasn’t so windy that I needed assistance to walk, but it was incredibly blustery. The thermometer by the port might have read 13c but the strong south-westerly gusts coming from the Antarctic were bitterly cold and made it feel much more like 3c. To add to that, there was a strange fine rain in the air almost constantly. Everything looked dry and the sky was often blue, but as you walked you were aware of some droplets being blown about on the breeze, and it wasn’t just sea spray. My hostel room was quite small with just enough room for a single bed, and small desk, and my holdall. It’s certainly the smallest room of the trip so far, other than the one I was moved out of in Castro. When I got there it was also incredibly dusty: the adjacent room had someone in it doing woodwork to fit a new door and door frame, and a lot of saw dust had entered my room via a series of holes (which I’m sure should have glass in them) above the door. This was soon sorted, however, and the hostel owner was very good in apologising about it and sorting it out.